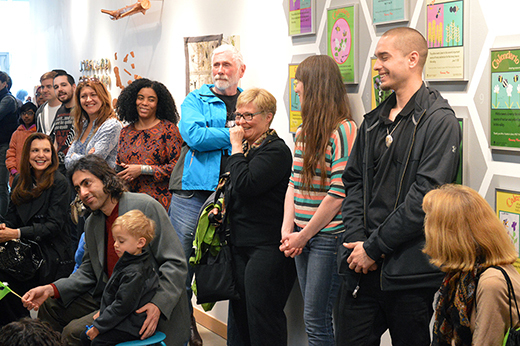 On Saturday, April 26, we gathered to celebrate the opening of a new exhibition of young people's art at the ArtStarts Gallery: Timescapes: Local Connections and Natural Indicators of Time. It was a joyful day and the gallery was buzzing with excitement and energy. Families, friends, artists, educators and people of all ages who love and appreciate art came out to share in the day's events. 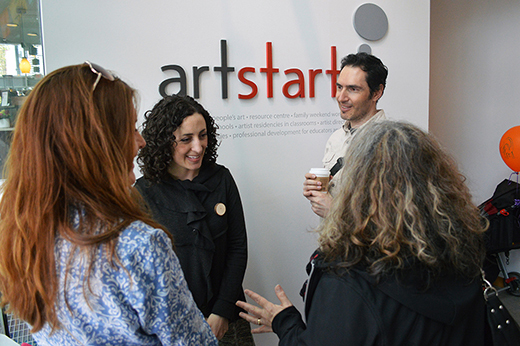 ArtStarts Program Coordinator Elfred Matining emceed the day, which kicked off with a welcome and introduction from Executive Director, Navida Nuraney. Curator Juliana Bedoya spoke about the process of putting together an exhibition and her inspiration for the theme of Timescapes, from combing through projects by students across BC that were funded by Artists in the Classroom grants to seeing inspiration in the rings of a tree that embody the passage of time. Joanne Yovanovich generously offered a blessing for the opening, and Nika Collison shared a beautiful song with everyone. It was a 'hummingbird song', a lovely complement to one of the artworks on the wall that depicts hummingbirds (and bears) in the Springtime. Nika chose this song, which was received from the Nuu Chah Nulth in exchange of a Haida song. As she explained, she shared this song for the opening "as metaphor of cultures working together in art and knowledge to achieve something great. Additionally, bird songs left with the bird migrations and returned when the birds do — a Haida understanding and view of time and ties to our natural world." 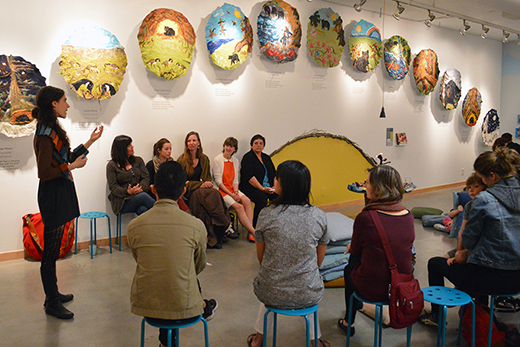 We we honoured to have many guests in attendance visiting from Haida Gwaii, where one of the larger projects you'll see on display originated: artists, educators and members of the community who each helped bring the project to life. 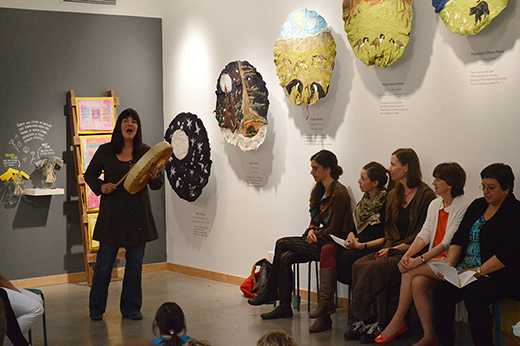 Taan's Moons was a project that took place over several weeks at six schools in Haida Gwaii. 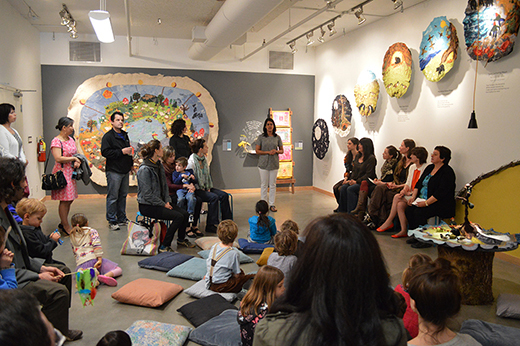 Kindergarten students worked with author Alison Gear and artist Kiki van der Heiden on a series of experiences, which incorporated storytelling and language arts, movement and yoga, local culture and heritage, visual arts and more. 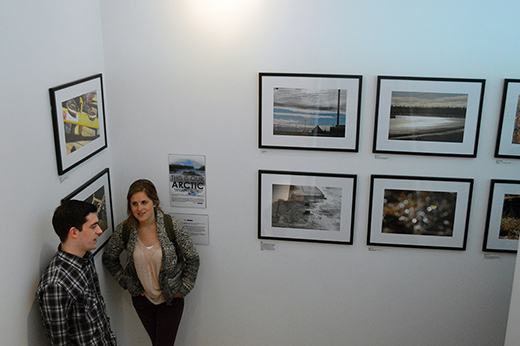 Photographer Jason Shafto captured the students' learning experience throughout the process. 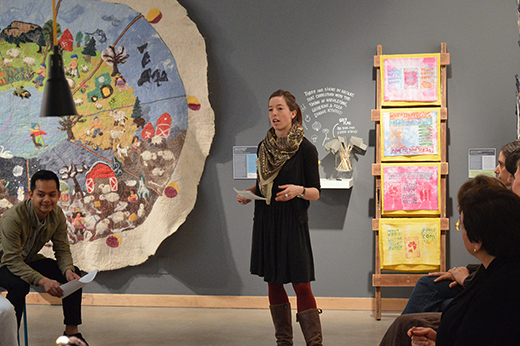 You can read more about the Taan's Moons project on the Arts Integration in Action guest blog on the Infusion Community of Practice or on the artist's website. 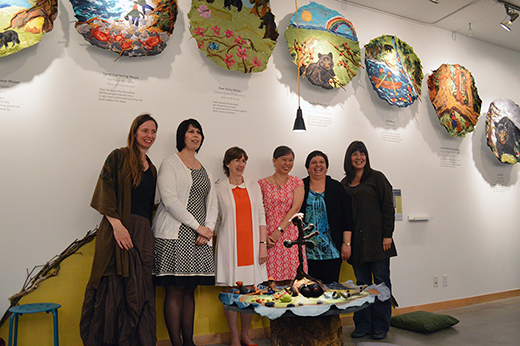 The pieces we have on display at the ArtStarts Gallery are 13 felted "moons" that describe the discovery of the twelve-month Haida Moon Cycle told through the eyes of a bear. We were happy learn that the proud grandparents of one of the young artists from Haida Gwaii were in the crowd! 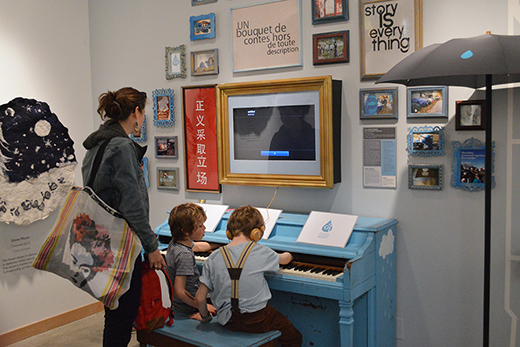 Next, Naomi Steinberg presented a project that she, along with artists Madeleine Sauvé, Igor Santzio, worked on with students at Mount Pleasant Elementary in Vancouver. Students asked themselves the question: "What role do we as citizens and tax payers play in influencing the development of the place we call home?" They also envisioned what a green redesign of the headwaters of te Statlew, the little creek now known as the St. George Rainway, could look like. 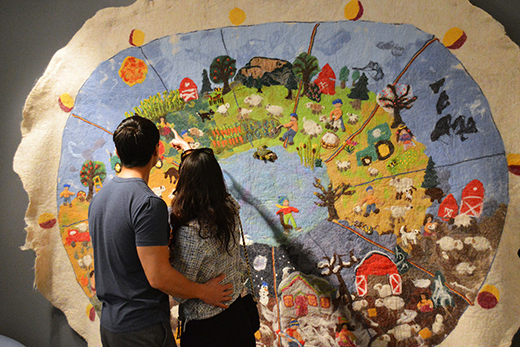 In addition to Timescapes, there is another exhibition now open upstairs, in the ArtStarts Mezzanine Gallery. This is Our Arctic is a stunning collection of photographs of climate change taken by youth in Old Crow, Yukon and Inuvik, Northwest Territories. The project was organized by BYTE, a 'for youth, by youth' organization, focused on empowering and promoting youth throughout the Yukon and Canada's north. Kara Johancsik from BYTE introduced the works on display and shared her insights on some of the stories behind the photographs. 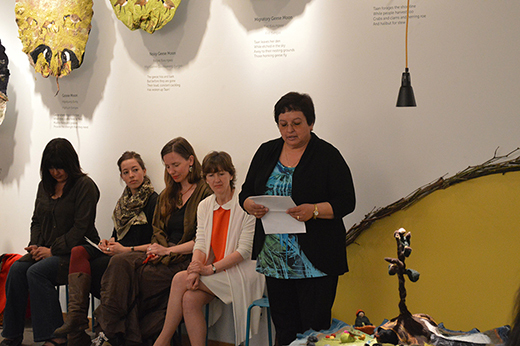 Thanks to everyone who joined us to celebrate the opening of Timescapes and This is Our Arctic. We are honoured to be surrounded by such a supportive community, and thrilled to be able to share these exhibitions with you. Check out more photos from the opening celebrations on Facebook. UPDATE: Watch TV coverage (en français) of the opening celebration.